The projects of professional programmer, designer, and graphic artist William John Holly III. You know what game I keep coming back to? A game that is loaded with tension, strategy, risk, reward, and scaling difficulty? Minesweeper. And it's a great example of how presentation can be everything to some audiences. Yeah, okay, you're probably groaning at Minesweeper. It's that little casual game that comes with Windows that nerds play to waste time, right? Well, that's exactly what it is. But that's also a pretty common way to describe tons of great, complex games. When you look into Minesweeper, it is very simple in its presentation and unpacks into something very complex. Now, as far as default Windows games go, Minesweeper isn't always the most popular. A game that I see people playing with far more often is the classic lonely card game: Solitaire. So how does Solitaire stack up to Minesweeper in terms of gameplay? Solitaire is a game where you sort cards. But check out that sweet palm tree! So shouldn't Solitaire be, like, way less popular than Minesweeper? Shouldn't Minesweeper be the main star of the default Windows games? Well, Solitaire ended up being considered one of the most popular time wasting games on Windows computers, and even became a common gag when TV shows in the mid 90's through the mid 00's wanted to show people goofing off on their computer (the other half of the time it was Space Invaders). 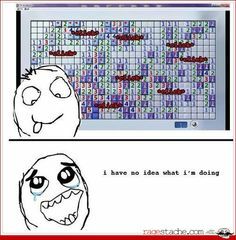 Minesweeper, however, is often cited as a game that most people never even bother to learn playing. It had colorful, fun card faces. No, seriously. 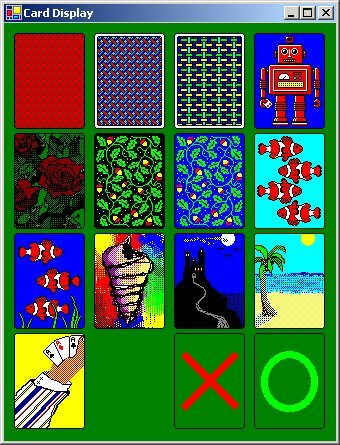 Solitaire had fun little clip art images (that even animated in certain versions) on Windows in a time when most programs didn't bother to have any kind of fun graphics. 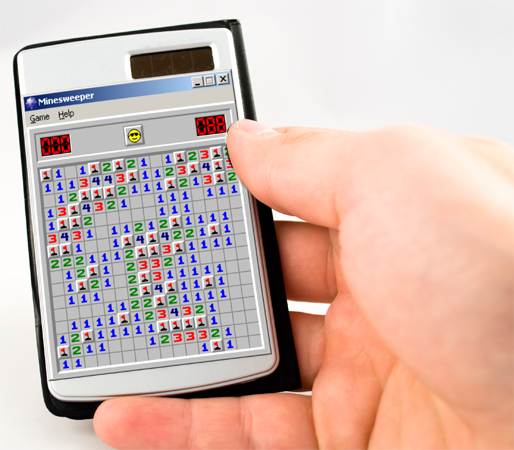 Meanwhile, Minesweeper looks like a calculator of some sort. 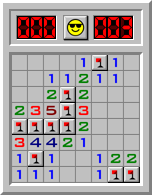 Even with Minesweeper's little yellow smile face at the top of the screen, you can't get around the fact that the game is a gray grid that you fill with numbers. That's so boring that I reread that descriptive sentence in the voice of Ben Stein. Meanwhile, Solitaire has bitmap playing cards on a playing screen that is green, just like a card table at a casino! Solitaire is, by far, the inferior game. It's a simple sorting game compared to a rich strategy game where the player must use logical deduction in a high stakes puzzle. I mean, it's no Wolfenstein 3D, but it's still pretty good compared to other default Microsoft games of the past. Wolf3D is actually a great example of how much of a difference a game's presentation can make. Wolfenstein 3D is considered the granddaddy of first person shooters. However, when broken down, Wolfenstein 3D is really just a top-down game presented from a first person perspective. "Hey, I ain't no FPS poser, buddy!" Since Wolfenstein 3D had no upward or downward movement or aiming, the dimension might as well have not even existed. Every asset was the same height (64 pixels tall) with shorter obejcts/enemies having sprites the same height, only with the remaining pixels above them filled in with transparent colors. Height in Wolfenstein 3D means nothing other than accomplishing perspective in a first person environment. 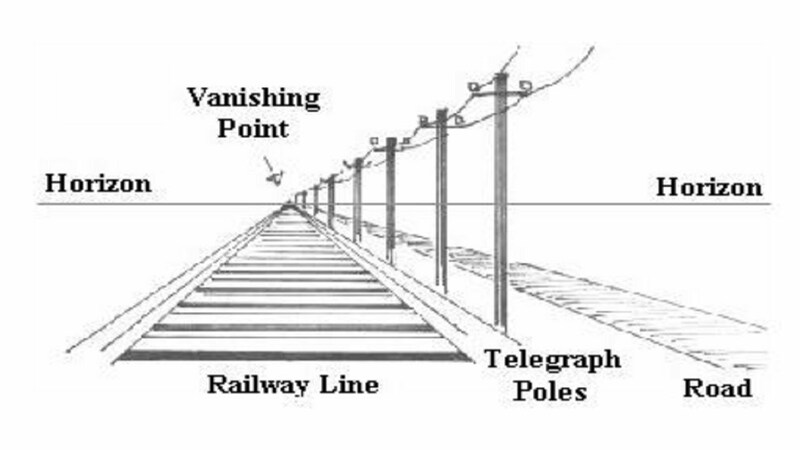 Since upward and downward position are fixed and the same for everything in the game, there are only two dimensions that really matter. To that end, you can easily ditch the FPS viewport and give Wolfenstein 3D an overhead treatment (with no change to the way the game played, given that the game masks things that shouldn't be within the player's line of sight). There are small differences here and there, but overall you'll want to play the first person version more. Why? Because perspective is fun, being able to gaze down long 3d-ish corridors is fun to do on a computer screen, and because the overhead view looks more boring. The first person mode is just a more fun way to present the gameplay. Presentation is hugely important. I hope you remember that and keep that in mind if you ever decide to make a videogame. Want to help me keep making free games? Try checking out my art shop and buying some cool merchandise with my characters and designs on it. It helps me stay alive long enough to make stuff!